You work a 40-60 hour work week, have children involved in school activities, try to carve out time for your spouse, plus you love teaching your small group. If you are going to do one thing with excellence each week you are bound and determined to set aside time to study and prepare to teach the Bible to your group. But leading a small group involves lots of other tasks as well. The reality is, in small groups, the teacher can't do everything. 1. Understand the ACE ministry principles. A - Absentees: Ministry must include staying in touch with absent group members. The best way to let someone know you care is to let them know they are missed. C - Crisis: Groups need someone who will help them stay informed about members who are facing crises and how the group can help. E - Encouragement and Evangelism: Both of these elements are so important for a healthy group. Group members need to be encouraged in multiple ways. Encouragement comes through words of affirmation, fellowship, and recognition. Evangelism begins with helping the group learn how to have faith conversations with other group members, especially new group members. 2. Look for at least one leader to enlist. Ministry Coordinator - This leader helps the teacher coordinate ministry and outreach. Responsibilities include greeting and registering guests, keeping accurate attendance records, leading the group to follow-up with absentees and guests, ministering to the needs of group members. As the group grows they help recruit and train other group members in the work of ministry. Co-Teacher (Apprentice, or Assistant teacher) - This person is learning how to lead a group for the purpose of eventually starting a new group when it is needed. He/she should teach from time-to time and learn how to do the work of ministry by functioning as or working with the ministry coordinator. 3. As the group matures and grows numerically look for additional leaders to enlist. A group may never develop leaders to fulfill all of these positions. That is fine. Quite honestly, if a group gets large enough to have all these leaders, they are most likely too large and there is a need to begin a new group so that all members and guests can be properly ministered to. The ACE ministry principles and enlisting at least one more leader to help carry out the principles are the most vital. It will be difficult for a group to grow relationally and spiritually without partnerships between teachers and group members who are willing to help. The teacher can't do everything. If he/she tries, something or someone will get lost in the process. God has given each group people. People are gifted and, most likely, stand ready to help if they are only asked. Teach your groups the ACE principles of ministry. Then challenge teachers to find at least one other leader who will help them, so that they can effectively focus on teaching the Bible each week. Maybe your group needs some specialized training. The 4:12 Network searchable database is a great place to start searching for the trainer or resource that could help. 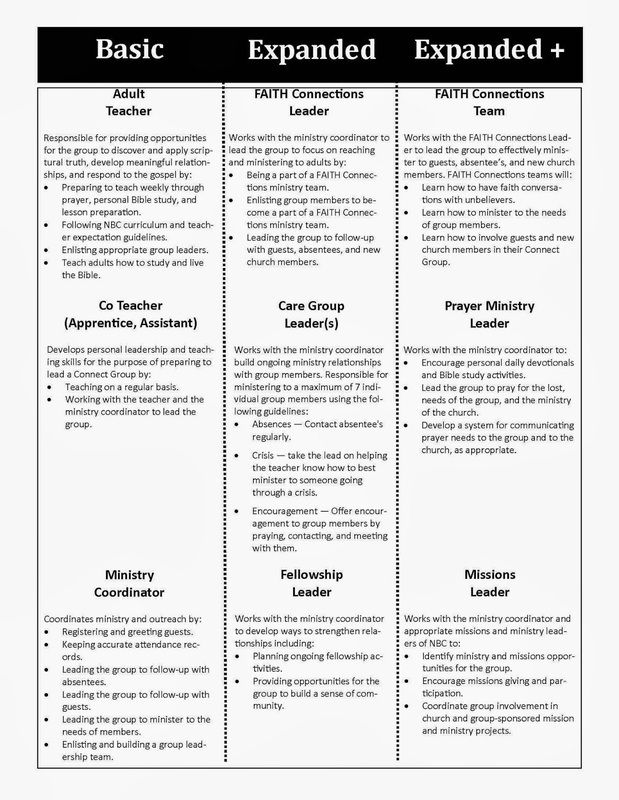 Below is our leadership information (Northside Baptist Church) we share with our group leaders. Maybe it will help you develop your plan to encourage your group leaders to find the help they need. 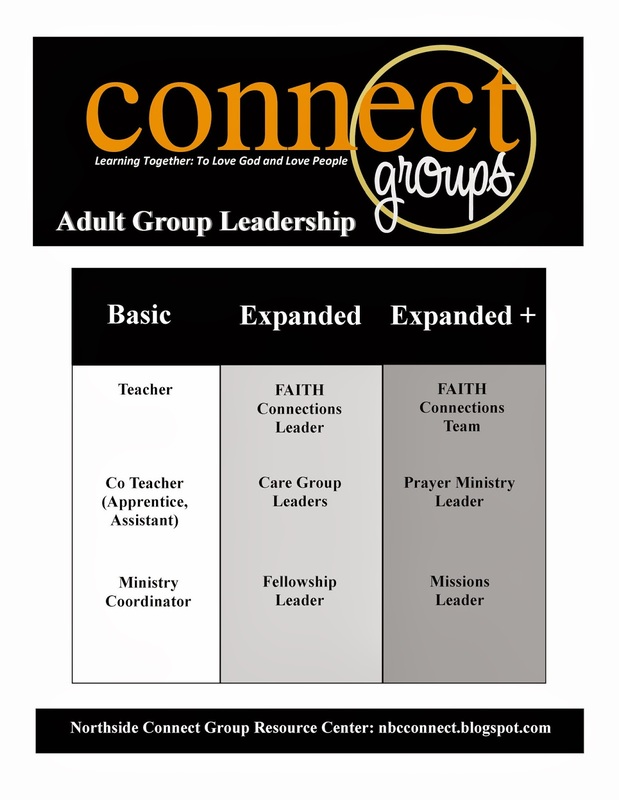 If you would like a version you can customize for your group, email me at john@412network.com and request the Connect Group Organization Guide.